Acrylic. 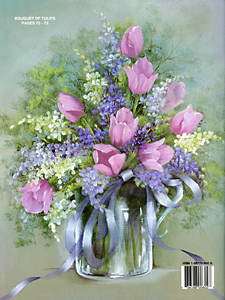 Gran's Journey is Ros's newest book brimming with beautiful flowers and landscapes. A white wicker chair painted in a calming summer garden. 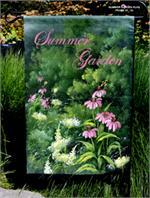 A white gate is the passageway between the beach and a summer garden in bloom. Le Poulet, hen is painting on a country rustic board. 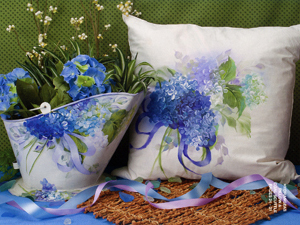 Blue hydrangeas and ribbon dance across a pillow, welcome sign and coal scuttle. Ros has painted two elegant Summer Garden flags, one painted with pink coneflowers and queen ann's lace the other Bittersweet and Mums. Beach Trio features 3 square panels side by side, the first an ocean scape, the middle a black and white diamond patterned lighthouse and the third a beach scene. 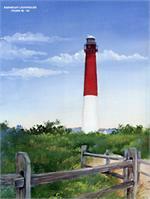 Barnegat Lighthouse on a sunny day boldy stands in white and red. 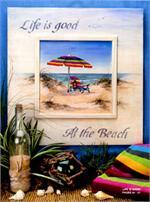 Life is good at the beach, painted on a large board with a colorful stripped umbrella and striped chair looking out towards the ocean on a warm day. Liz's barn is a quiet green landscape with a rustic barn and crow. Pond at Landgrove is a peaceful, reflective pond setting surrounded by fir trees and forest. 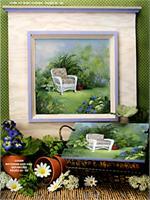 Monet's Garden is a trio of delightful mini landscape shots of garden flowers. Pumpkins for Sale, pumpkins, mums, a black urn brimming with a fern make up this delightful fall scene. Sewing Box, is a metal box with lemons, thread spools, ribbon, daisies and scissors. Fruit on A Pie Basket, watermelon, strawberries, pears, apples and mini violet berries are always a favorite painted on a wooden pie basket. Red Geraniums fill clay pots and a vintage watering can create a beautiful design you will want to paint. 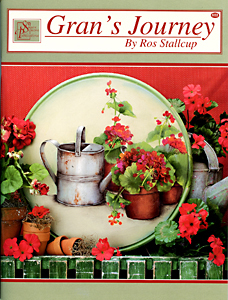 This is going to be another favorite book by Ros Stallcup.